The third album from US industrial rockers Davey Suicide sees the band take a darker and heavier turn than their previous releases. While their last two albums were prone to heavy outbursts, they still felt at home with the rock tag amidst the electronic and industrial embellishments. Yet this time things feel a lot more metal. After a sinister and thickly layered intro, the band dive headlong into 'Rise Above' recalling the likes of recent Combichrist, Dope, as well as a little bit of of the usual Marilyn Manson and Tim Skold influences. It's a fist-in-the-air and middle finger-in-the-face kind of approach and it works damn well. The song construction is a little along the nu-metal meets industrial style that was popular in the late 90s and early 2000s, but with a cleaner and razor-sharp approach. With songs such as the affore mentioned 'Rise Above, along with 'No Angel', 'Too Many Freaks', 'Anti-System Revolution', 'No Place Like Hell', and 'Made From Fire' the album is a riotous and angst ridden sonic exorcism. It is a strong album but it does have its week points, partly through a lack of variation as it is pretty much balls-to-the-wall from start to finish. Something a little experimental, instrumental or soft to take it in a sudden change of direction would be good, without simply resorting to a semi-ballad as it does on the final track. In terms of production it is sport on. The vocals strike hard amidst the maelstrom of guitars and electronics. It is confident, crisp and modern and doesn't try to replicate the Nothing or Wax Trax! styles, rather favouring it's own method. 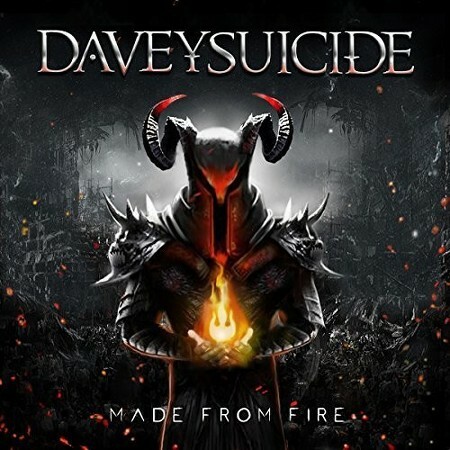 'Made From Fire' is undoubtedly the strongest release from Davey Suicide so far. It has a great metal edge that feels genuine, and some of Davey's best vocal performances yet. It may lack variety, but for those fans of bands such as Dope, Static-X, Powerman 5000, Rob Zombie and Tim Skold, is is a pretty solid choice.